A birthday, a win, an engagement. LeBron James ended 2011 and began 2012 with a bang. He got engaged to longtime girlfriend Savannah Brinson on New Year’s Eve, proposing during a private party at Miami Beach’s Shelborne Hotel. The two have been together since high school and have two boys together, 7-year-old LeBron Jr. and 4-year-old Bryce, The Miami Herald reports. A photo of the moment shows Brinson appearing overwhelmed with emotion, with James standing next to her decked out in a tuxedo top with a bow tie, black and red plaid pants, and black rimmed glasses. 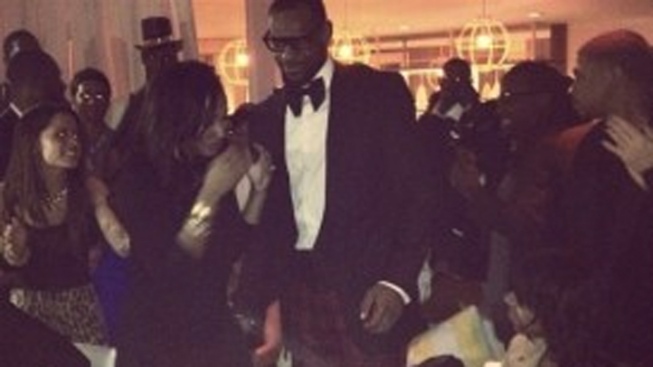 The New Year’s Eve gathering was James’ 27th birthday party, but quickly turned into a celebration for the Miami Heat superstar and his betrothed, Larry Brown Sports reports. Congrats rolled in on Twitter. Heat owner Micky Arison said he was “so happy” for James and Brinson. Among those attending the dinner were fellow Heat Big 3 members Dwyane Wade and Chris Bosh, James’ mom Gloria, Queen Latifah, Nas, and actress Gabrielle Union, according to the Herald. James turned 27 on Friday, helping lead the Heat to its fourth straight win of the 2011-2012 season that night.